I am very excited to welcome back Darlene Franklin. She visited us a while ago, you can read that interview here. She has a new book out this month and she talks about that below. Enjoy. 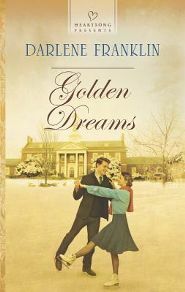 My book, Golden Dreams, has released this month. With hometown champion Frank Sawtelle as her coach, she has a real chance to compete in the world’s foremost skating competition. But her siblings want her helping on the farm—not wasting time on the ice. And as her feelings for Frank turn to love, she wonders if he could ever feel the same. Still bitter over the injury that shattered his competitive hopes, coaching Winnie resurrects Frank’s career. But as his love for her grows, a romance could jeopardize her success. While he keeps his feelings to himself, he yearns for a future with Winnie…one more precious than gold. Oh, everywhere. I hear the name of a place–Okay, Oklahoma, anyone? Or an interesting historical fact—cowboys went on strike in Texas in the 1880s. I see something on the side of the road—a castle, in Tennessee? A single boot? Golden Dreams grew out of my love of the Olympics and figure skating. Maple Notch is fairly close to Lake Placid, New York, the home of the 1932 winter games. My heroine is an Olympic hopeful. The depression provides a counterpoint to her golden dreams. Is she wrong to dream of the Olympics when so many are suffering? I recently read a blog asking whether you were a plodder, a pioneer, or a pathfinger. Meaning outline, seat-of-the-pants, or a bit of both. I’m a bit of both. I have to write fairly detailed synopses, but then I start writing, and things change. I would say “yes.” But I did have one not-yet-published novel published. That one book gave me more trouble than all the other ones put together. From that experience, I decided that I wouldn’t want to go through that again. If the books weren’t accepted then, there was probably a good reason. Oh, yes! Most of them have a small part of me. Well, they have to, don’t they? I create them. The one who is the closest to my actual biography is Carrie Randolph in Romanian Rhapsody, my first book. Absolutely. After Maple Notch Dreams, I will write the final three books in my nine-book Maple Notch saga. Three contemporary novels will finish the story of a small town in northern Vermont from 1777 to the present. Hi there wonderful readers. I am so excited to introduce you our writer today. Sit back and as we get write to the point with Darlene Franklin. I tell people that the most interesting fact about me is that I write full time from a nursing home. (More about that below). My daughter died 5 years ago, but God has blessed me with a wonderful son, his wife, and four beautiful grandchildren. I am from New England, but moved to Texas for seminary and have lived west more or less ever since. I have been interested in writing all my life, but I began writing seriously (every day) in the wake of my divorce 22 years ago. My first book (Romanian Rhapsody, still available as an ebook from Barbour) was contracted in 2003. My mother was saved when I was seven. I saw a big change in her, and also longed to belong to the church. So during VBS when I was nine, I asked Jesus to become my Lord and Savior. Hallelujah! In Calico Brides, four unmarried women in the town of Calico, Kansas, decide that missions should begin at home, and each seek a special project from God. If we each look at our communities like that, what might God lead us to do? I’d also love to mention three books from May: In Barncastle Memorial, an older widow and widower both celebrate their pasts and look forward to the future through a special “this is your life” vacation. In Texas Brides, my novella, Angel in Disguise, takes the New Testament church as the model for caring for the poor. And Hidden Dreams, both hero and heroine have to trust God with their secrets. On Sundays, I write a potpourri blog about my life, my writing, contemporary news. . .whatever is on my heart. I also share my writing news. Check it out at darlenefranklinwrites.blogspot.com. Once a month, on the 12th, I write an article about some historical subject at christianfictionhistoricalsociety.blogspot.com. I’m reading Stealing the Preacher by Karen Witemeyer. You have to love a story where the heroine’s father “steals” a preacher from a train for a birthday gift! Not only that, but Karen makes it completely believable. Ooh, I am going to be reading that book soon, I can’t wait! Living in the nursing home! No one enters a place like this as an ideal choice. But since I’ve been here, God has blessed me so abundantly. God has used me to encourage both fellow residents and staff, and I’ve had renewed ministry through my daily devotionals. For I am convinced that neither death nor life, neither angels nor demons,[a] neither the present nor the future, nor any powers, neither height nor depth, nor anything else in all creation, will be able to separate us from the love of God that is in Christ Jesus our Lord. (Romans 8:38-39 NIV) That’s the verse I cling to. Here is a verse that struck me a few months ago in my devotional blog: “David proceeded with a longer stride, a larger embrace since the God-of-the-Angel-Armies was with him.” (2 Samuel 5:10, MSG) I’ve taken it as a challenge to stride longer and reach farther in my ministry. 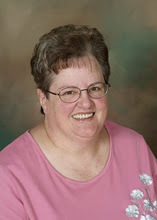 Darlene, thank you so much for taking time to talk to my readers, we love hearing from authors. 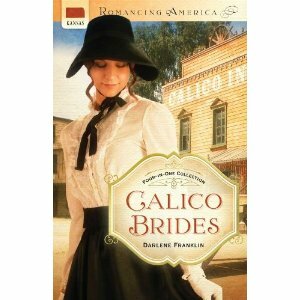 Readers, Darlene is giving away a copy of her book, Calico Brides. Leave a comment for her by June 18th at 5:00 Pm to be entered.